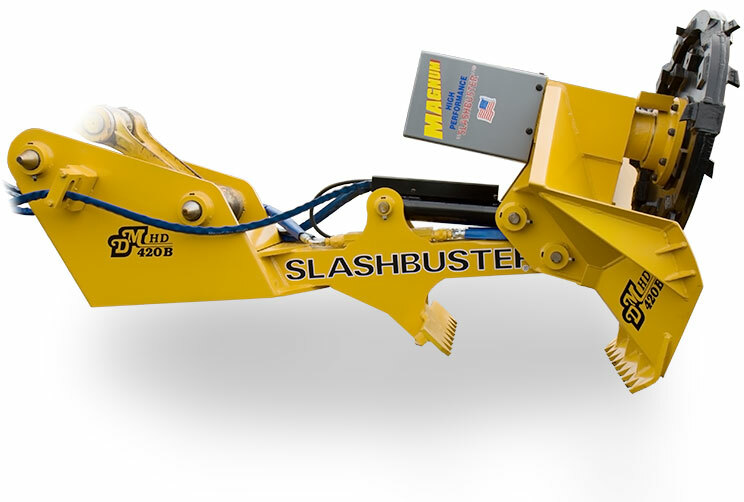 "SLASHBUSTER"® HD420B MAGNUM-XE brush cutter attachment w/ 46" cutting swath, interior parts all the same as our larger HD 480B and at any given RPM they are functionaly identical other than tip speed, the HD 420B just has a scaled down outer housing and smaller diameter wheel (with 18 vs 24 tooth pockets) for weight considerations on smaller excavators. (video shows it mounted on a Hitachi 160 class excavator with optional tilt mount) This reduces haul costs and increases mobility compared to the larger HD480B - which is normally mounted on 20 ton size excavators or larger. The MAGNUM-XE motor assembly developed in response to higher tiered excavator requirements. Compared to standard MAGNUM motor assembly it offers higher RPM with lower flow and has a higher PSI rating. The MAGNUM-XE is now standard on all "SLASHBUSTER"® models beginning with "HD". For this installation the excavator dealer independently configured Deere 160G (see video below) for the three aux circuits(motor, third boom and tilt mount cylinders) and plumbed all hydraulics. Some specs listed on our website may need revision, please call for current options. Motor here is seen running at ~32GPM free flow, rated relief pressure for the motor is 4250PSI MAX (GPM can go much higher). At 32GPM, the wheel is spinning at ~600RPM in video with standard S-7 teeth only, carbide options available, while the standard S-7 teeth now come pre-sharpened and if maintained properly and sharpened as needed cost less that $1/hr of operation. Long term testing to ~1050RPM (using lower displacement motor) revealed no issues with the bearing housing, etc. other than normal wear items such as the teeth and mulching disk: to be expected of any machine under these conditions).